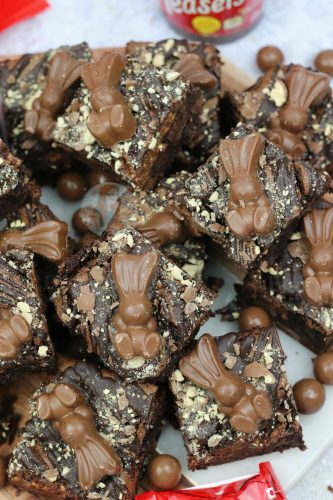 Fudgey, Chocolatey, Gooey Malt Chocolate Brownies with Malteser Spread, Maltesers and Malteser Bunnies! 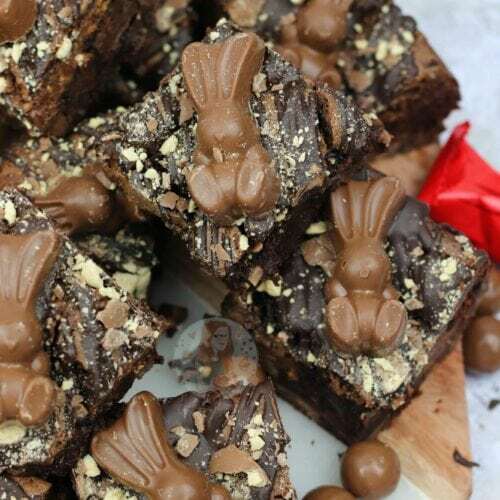 Perfect Malteser Brownies. Soooo Malteser Bunnies are the best. 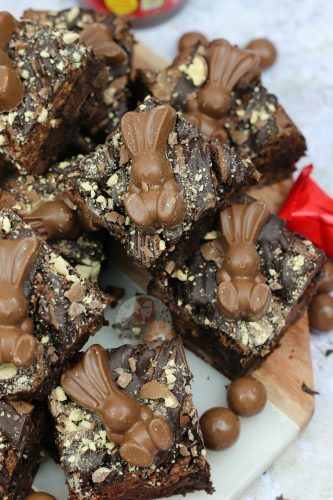 Like, even if you don’t like Maltesers themselves, you’ll porbably like the Bunnies. They’re another of those Easter Treats that make me sad that they’re not available year round.. but alas, it just means I need to stock up now before they’re gone again. But anyway, these are seriously yum. They took a bit of ~necessary~ testing because they kept on getting devoured, but that just led to the perfect recipe. 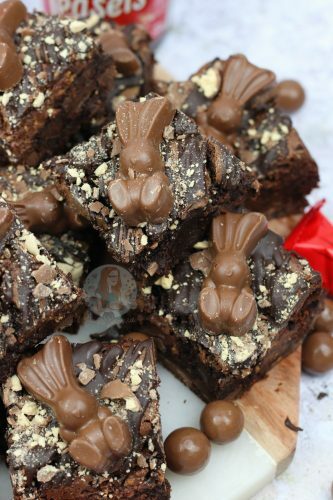 I will say that I can call them Malteser Brownies because they use the spread, maltesers on the top, and the bunnies, but there aren’t any actual Maltesers in the brownie itself. I tried several times, but it just doesn’t work for me. They create a little crunch here and there, but otherwise they mainly dissolve which isn’t for me. However, its why I used Malt Powder in them, and then dollops of the spread. I wanted to have the ‘malt’ flavour in there, but not waste loads of Maltesers in the process. You can get the spread in basically all supermarkets now next to where Nutella is, and its dreamy. Spread it on toast, use it in a cake like I do in my Malteser Cake or my No-Bake Chocolate Malteser Cheesecake, or just eat it with a spoon. Or, dollop it into brownies and swirl to create pockets of heaven. Honestly, I have eaten far too many of these jars in my time, and they do other versions like Twix, and Bounty and more. But, Malteser wins it out for me. It tastes so chocolatey, with little malt lumps in it and OH MY DAYS yum. So with that, and a fudgey and gooey brownie, you’re on to a winner. For the Malt Powder in the recipe, I just used a Horlicks malt drink, and on another bake I used Ovaltine. Both of them work really well as they’re quite strong in flavour. 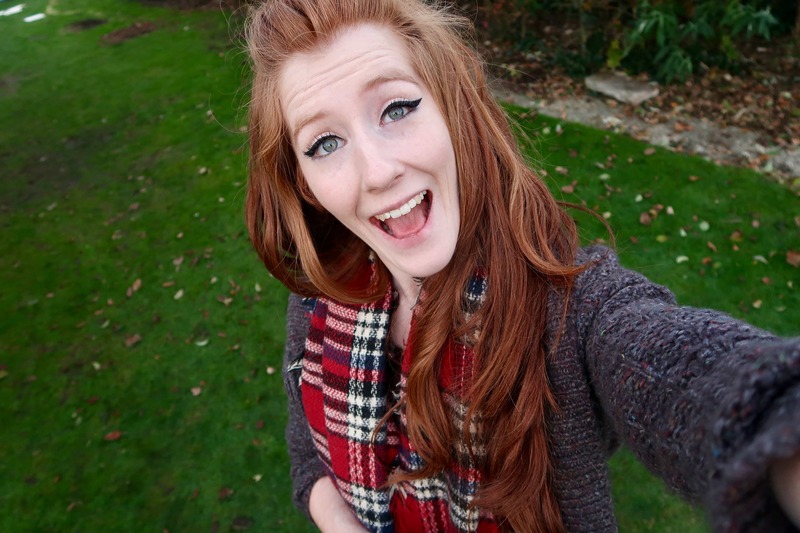 I tried out the Malteser Hot Chocolate drink, and it wasn’t the best to be honest, so that was a little sad. I really do find that if you want the flavour of the Maltyness to come through, you should really use a standalone malt drink powder. I’ve always had people say that Maltesers are one of those sweets that you lie, but you would never pick first. And, I kinda get it in a way but thats because I am so obsessed with other sweets, and not because I’m snubbing Maltesers. However, adding them to a recipe and I can’t help but love them… Like, my Malteser Cupcakes have always been a hit because its the mix of Chocolate Cupcake, Malt Buttercream Frosting, and Maltesers. YUMMY. Preheat your oven to 180C/160C Fan and line a 9x9inch Square baking tray with parchment paper. Melt together the Butter and Dark Chocolate together in a heatproof bowl over a pan of boiling water, on the microwave in 20 second bursts until melted. Leave on the side to cool whilst you do the rest. 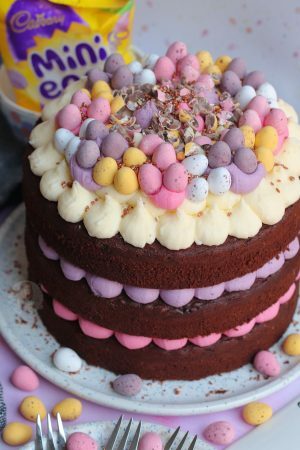 Using an electric whisk/stand mixer, whisk together the Eggs & Caster Sugar for a few minutes until the colour has turned pale, is very mousse like, and is double the original volume of the amount of eggs + sugar! You will know its done because when you lift the whisk up out of the mix it should leave a trail for a couple of seconds before disappearing! Once completely combined, add the cocoa powder, malt powder, and plain flour on top of the chocolate mix and then fold together again – still be careful to not knock out the air! Fold through the Milk Chocolate chunks, and pour into the tin. Add in dollops of the Malteser spread and swirl slightly. Bake in the oven for 25-30 minutes. Some ovens can take longer, such as up to an hour! Once baked, leave to cool in the tin completely. 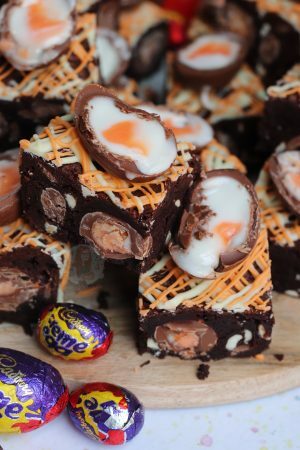 Once cooled, drizzle over 100g of chocolate, and add on a Mini Malteser Bunny for each slice. Crush over some Maltesers. Once the chocolate is set, slice them up! Depending on your ovens, or how you mixed the brownies up, some can take up to an hour to bake successfully. I’ve never fully understood why, but don’t give up if they’re not done after 30 minutes – cover with foil and continue to bake for longer. I poke a skewer through them and wait till its mostly clean, and the mixture doesn’t wobble in the tin. If they've been in for an hour, but are still looking a bit undone, remove from the oven, cool completely, and leave in the fridge for an hour before cutting. 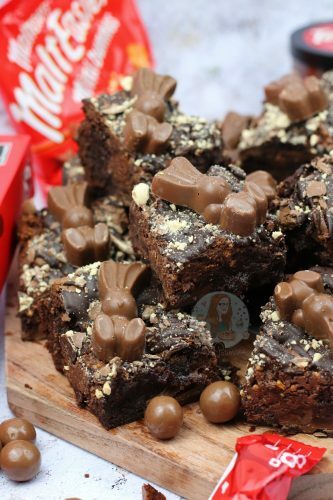 I used Malteser Bunnies as it was Easter time when I made these, but you can easily decorate with just Maltesers as well! 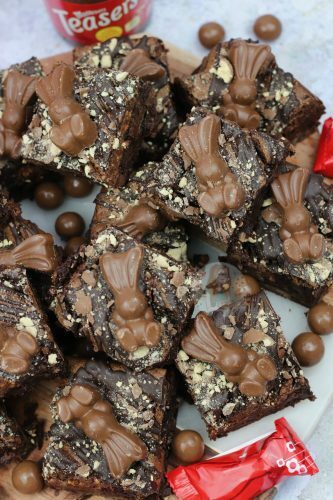 You can bake Maltesers into the brownies as well if you wish, but I find that they basically dissolve when baked so there isn't much point. 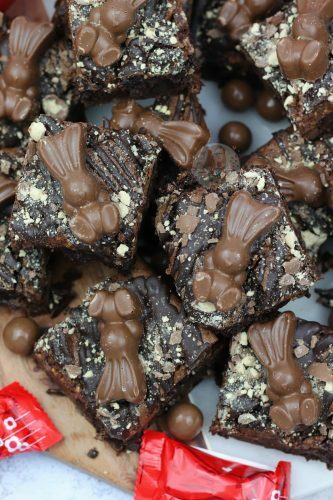 I have made these using Horlicks, and Ovaltine and either work well! Malteser Spread can be found in supermarkets near the Nutellas and such! Find my other Brownie & Easter Recipes on my Recipes Page! Older Next post: Mini Egg Cookies! Newer Previous post: Carrot Cake Traybake! Yes you can use 3x large eggs – and you can use it without the malt powder, but I really do recommend using it for the best flavour. If not however, use 50g cocoa powder instead of 25g. Hi I hope you don’t mind me asking, do you have a recipe for making bubble gum flavour syrup for putting over cakes thanks. Hi , I hope u don’t mind me asking you , do you have a recipe for making bubble gum syrup for putting over cakes thanks . 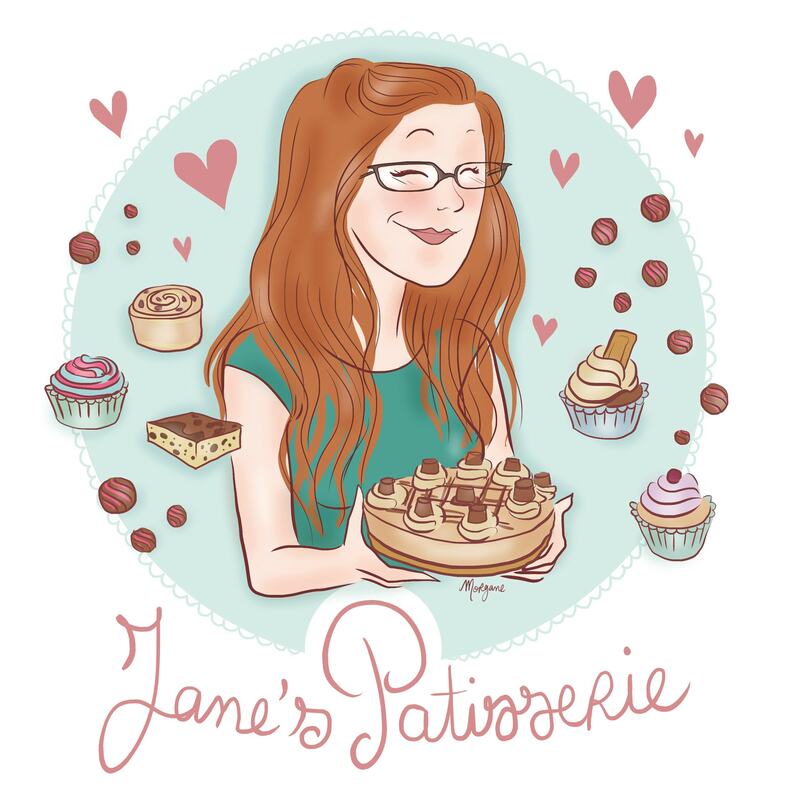 I cannot wait to try these recipes, its so refreshing that a baker posts their own recipes out for the world to try!! Thank you from us all!! 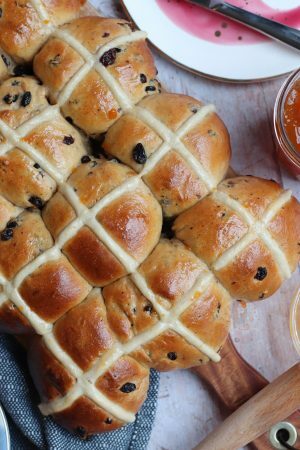 It was the first time I’ve ever baked anything – so I did have to go and look up a couple of things, like what folding was – but your recipe was really easy to follow. And delicious. Have I mentioned that yet? Sorry I forgot to mention that I live in Australia, and I have never seen Malteser Spread here. Is there an alternative I could use instead? I have a nut allergy and can’t eat the spread as it says it has traces in. Is there an alternative I could use? Hi, where can I buy Malteser Spread?